A story about two friends and their adventures. The buddies in question serve as dual protagonists. The friendship itself will provide much of the drama along the way, as the buddies in a Buddy Picture are usually an Odd Couple. The resolution of a Buddy Picture typically depends on the friends working in concert together to defeat a common enemy and reap a shared reward. Needless to say, the Buddy Picture is fueled by The Power of Friendship. As with any genre, there are certain flavors that spring up over and over. Sometimes the buddies involved don't start as buddies, but bond over their shared adventure. Almost always things come between them. Occasionally one of the buddies in the Buddy Picture is focused on a little more, making him or her the primary protagonist. Though scenarios like these can change the shape of a story a bit, don't be fooled: it is still a Buddy Picture. The Buddy Picture can manifest itself in many diverse settings, and the central relationship can exist in many sorts of plots. Because of this, the Buddy Picture is typically crossbred with other more plot-dependent genres, such as westerns, action-adventures, and road movies. One of the most common variants of this type of story is the Buddy Cop Show. If the story is a comedy that focuses solely on the relationship between male Heterosexual Life-Partners, it is a Bromantic Comedy. Historically, the Buddy Picture flourished particularly well in film, hence the name. However, this genre can be found in all media, as evidenced by the examples below. Because of this, the trope has Buddy Genre as a redirect for use on works pages that aren't classified as films. Gundam Build Fighters, about two partners (A Gunpla builder and a mysterious boy from a different world who does the Gunpla fighting for him) who try to make it to the Gunpla world championships. JoJo's Bizarre Adventure became this in Part 7, Steel Ball Run. Johnny Joestar, a paralyzed prodigy jockey, takes interest in Gyro Zeppeli, and joins a horse race across America with the express purpose of learning about him and his Spin technique after he finds himself very briefly able to stand. Gyro himself has his own, more complex reasons for joining the race, but the two nonetheless hit it off, their friendship and dynamic taking up very much of the story. Hunter × Hunter starts out with Gon, Killua, Kurapica, and Leorio as the main cast, with Hisoka as the occasional adversary, but focuses mostly on Gon and Killua starting with the Heavens Arena arc. The other characters come and go, but Gon and Killua's adventures are the most consistent aspect of the series so far. Zander Cannon's graphic novel Heck is a rare breed: a horror Buddy Picture. Aladdin by Word of God. The Emperor's New Groove, based around the adventures of Kuzco and Pacha. Home, most of the film focuses on Oh and Tip's journey to Paris, and then Australia, to find Tip's mom. Toy Story, which focuses on the adventures of Woody and Buzz. A Fine Mess, about two buddies, a struggling actor and a frustrated waiter, who discover a horse-doping scandal. Bill & Ted, a franchise of films and television shows (both live action and animated) about a time and dimension traveling pair of teenage boys. The Blues Brothers, in which the buddies are also the titular siblings. Butch Cassidy and the Sundance Kid, a western about outlaw buddies. Dumb and Dumber, about two buddies on the road to return a suitcase full of money to its rightful owner. 48 Hrs., featuring buddies of the cop variety. A Very Harold & Kumar 3D Christmas. Knockin' on Heaven's Door, about two terminally ill young men on a last journey to see the ocean while being chased by both gangsters and the police. Lethal Weapon, the quintessential 1980's buddy cop flick. Midnight Run, in which a cop-turned-bounty hunter strikes up a friendship with the guy he's supposed to bring in while traveling cross-country and evading the mob. 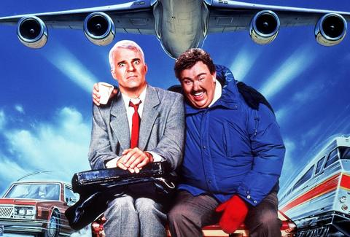 Planes, Trains and Automobiles, a film about two men trying to get home in time for Thanksgiving. The Road to ... series is probably the Trope Maker. Bing Crosby and Bob Hope play a pair of madcap goofballs who get in crazy situations in various exotic locales. Romy and Michele's High School Reunion, a film about about lifelong buddies going to their high school reunion. Sholay fits this trope to a T. It even has a buddy song ; ie; a song where buddies sing to each other about how great buddies they are (yes, it's a duet and both singers are male). Also has one buddy Taking the Bullet so the other can have a happy life. See No Evil, Hear No Evil: A blind guy and a deaf guy have to solve a murder mystery they witnessed (the blind guy heard but didn't see what happened, the deaf guy saw but didn't hear what happened). The Sting, being a Spiritual Successor to Butch Cassidy And The Sundance Kid. Thelma & Louise, an action adventure road movie about two women on the run. Tommy Boy, two former high school buddies have to work together to save their hometown business. The Truth About Cats & Dogs, a Distaff Counterpart starring Janeane Garofalo and Uma Thurman. Wayne's World, a comedy where the title character receives the primary focus, but the friendship with his buddy is integral to the plot. Don Quixote of La Mancha and Sancho Panza. Rincewind and Twoflower in The Colour of Magic and its direct sequel, The Light Fantastic. Between the trip in the present and Agnes and Bo's meeting in the flashbacks, Run hits all the required notes. Breaking Bad is a textbook example. Walt and Jesse, despite their differences in age and approach to meth-making, find enough common ground to continue their trade. Laverne & Shirley, a sitcom about two female factory workers trying to make it in the city. Psych is a classic example, featuring an odd couple of crimefighters. 2 Broke Girls, a sitcom about two female food servers trying to make it in the city. Adventure Time is the story of two best friends, a boy and a dog raised together, who have adventures and solve problems all around a magical, post apocalyptic world. Ernest et Célestine is about the development of the surprising friendship between the mouse Celestine and the bear Ernest and what happens after they become friends. Phineas and Ferb is a show that revolves around two step-brothers trying to make every day of summer vacation count. The duo of Shaggy and Scooby-Doo gives the ensemble of characters that stars in the franchise a touch of the buddy genre, but it doesn't get the proper treatment until Shaggy & Scooby-Doo Get a Clue!, where the other members of Mystery Inc. are dropped in favor of focusing on the buddies.